Hub and I went out for Vietnamese food tonight. The grilled pork, vegetables and vermicelli with hoisin sauce was very tasty. The Tiger beer that we drank with it was even better. I just didn’t feel like grilling another chicken breast and tearing up romaine lettuce for a side salad. The bright mornings and longer days certainly have lifted my spirits. Instead of taking the elevator today as I went from meeting to meeting, I took the stairs every time and felt very virtuous. My clothes are fitting better. Sizes going down. 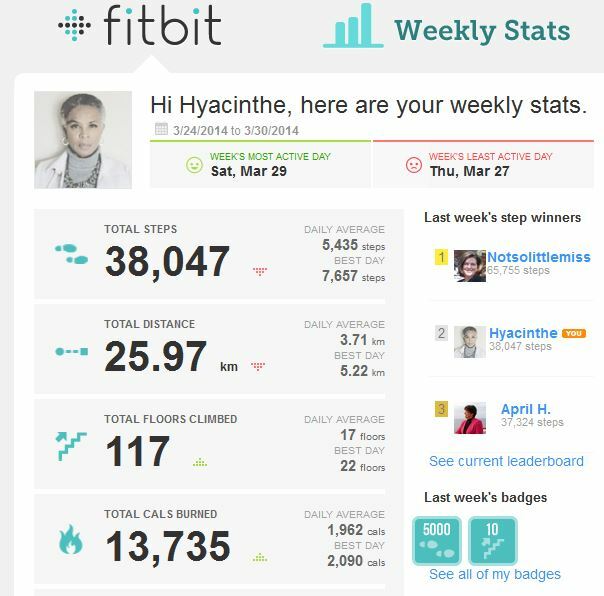 My FitBit stats from last week weren’t bad, either. A couple of slow days when I was at sewing class. I know that I have to move more. Gee, it sounds like I’m a broken record. I know what I have to do but I’m not stepping up and getting it done, yet. But I will. Life is good.